Since I read recently how it could make a positive impact on our environment, I've been trying to eat vegetarian more often. And while I've got a few good meatless meals in my repetoir, it is always good to try some new ones. The Modern Vegetarian Kitchen by Peter Berley of Angelica Kitchen in NYC offered some interesting choices. This amazing book has really enticing, sophisticated recipes (and a cute chef.) Moosewood Cookbook it is not. I started with a pasta of cauliflower, raisins and pinenuts that was like nothing I've ever tasted before and very restaurant-y. 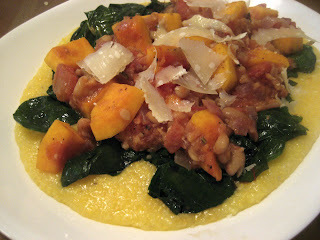 Next I went with this recipe of White bean, Squash and Sage Ragout over polenta. I went for a layered presentation of polenta, some sauteed garlicky greens and then the vegetable stew. It looked good and smelled good but I overcooked my beans and they got mushy. I thought it was still OK. Dear husband took a pass on leftovers the next day - not a good sign. Undaunted by this less than successful attempt, I moved on to another vegetable stew. This one from Deborah Madison's Vegetarian Cooking for Everyone, one of my favorite cookbooks. Moroccan Chickpea Stew is a little labor intensive, but worth it. This stew is like an exotic chili, full of chickpeas, spinach, tomatoes, onions, garlic and spices. Great dish. Another fun one that scored major points for vegetarianism with Dear Husband is Sweet Potato and Black Bean Burritos. At first he grimaced at the idea of sweet potatoes in a burrito; but he changed his opinion soon after tasting. This one is from Sara Moulton Cooks at Home, an oldie but a goodie in my cookbook library. These are pretty simple to put together and they come off more as a snacky, indulgent dinner, rather than a healthy one. But they are in fact quite healthy, especially if you use some of those health conscious tortillas that are now available in most supermarkets. (They have no trans-fats and usually added fibre. Some are low carb, some low fat, low-cal, some whole grain: pick your fave. I find they taste pretty good) So if you combine that, with beans and sweet potatoes and you don't overdo it with the cheese, then you're golden. Golden and crispy brown, that is. Meanwhile, heat 2 T. veg oil in a large skillet over medium heat. Add the onion and cook, stirring often, until softened, about 5 minutes. Add the garlic and cook for 1 minute longer, stir in the cumin and chili powder and cook for 1 minute longer. Add the beans and veg stock, cover and cook until beans are soft and the flavors have blended, about 5 minutes. Use a fork or potato masher to coarsely mash the beans. Taste and season with salt and pepper. You should have about 1 1/2 c.
Remove the potatoes from the oven and cool. (Keep the oven at the same temp.) When the potatoes are cool enough to handle, halve and scoop out the flesh. Place flesh in a small bowl and mash with a fork. Discard the potato skin. Add the nutmeg and season with salt and pepper. (I don't like nutmeg much, so I went really light.) You should have 1 1/2 - 2 cups. Spread the tortillas with roughly equal amounts of the bean mixture and top with equal amounts of the potato puree. Sprinkle on equal amounts of scallions and cheese. Roll the tortillas into cylinders and arrange seam side down on a baking sheet (large enough to hole them in one flat layer,) Brush the tops with veg oil. For softer burritos, cover with foil and bake until warmed through, about 20 minutes. Bake uncovered for crispy burritos - that's the way we like them. If you use bigger tortillas, you make less, of course. I made three big ones from one large sweet potato and 1 can of black beans. For you Fine Cooking readers: I've got the black bean falafel in mind for a dinner very soon. Sheri - I can't forget the picture you posted of those. Plus I think there's a black bean burger from a recent issue that I haven't gotten around to making. Deborah Madison is one of my favorites too! Oh, and we loved the black bean burgers.